I thought this little flower might be a nice thing to look at this morning. 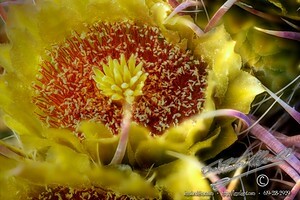 This is a single flower, and the very edge of a second flower, on the crown of a Barrel Cactus. Cactus has always intrigued me because a flower is the sexual heart of the plant, and yet, on a cactus, it is surrounded by spiky, dangerous, barriers to the sweetness therein. If you try to break down the barrier to get to the sweetness, you are harmed, and you harm the plant. But, if you are the target of the plants affection, the spikes are no barrier, they are only facilitators, helping you along your mutual path of desire. In the end, the bee gets the nectar, and the cactus, … ? … Well the cactus gets little cacti. This entry was posted in Desert, Flora, Flowers, Purchasable - As Art Prints. Bookmark the permalink.